Why Should I Care What Lipstick Frida Kahlo Wore While She Painted? It’s safe to say that Frida Kahlo has become trendy. White women dress up as her for Halloween and there’s merchandise of her likeness (tote bags, t-shirts) for days. In the process of Kahlo becoming the sort of contemporary art figure better celebrated for her appearance and style rather than her actual art, the political, explicitly Communist nature of her work has been whitewashed in the process. Kahlo was a radical, not just a cool-looking woman to print on a sock. 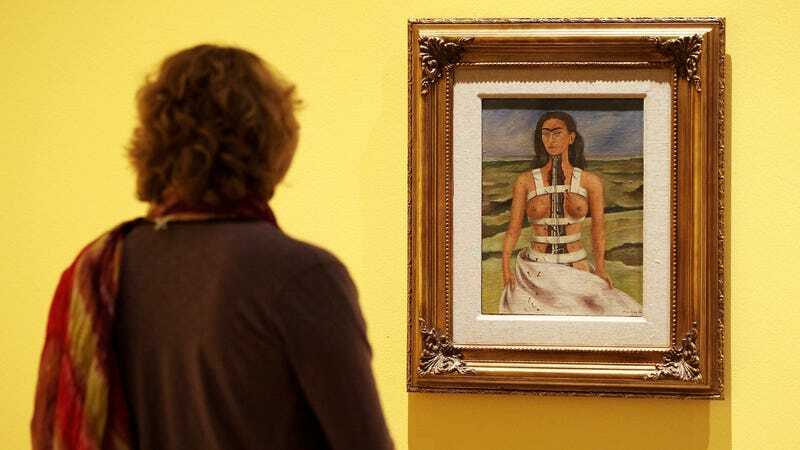 You’d think that a recent survey exhibition of Kahlo’s life, coming to the Brooklyn museum this February, would seek to reverse this unfortunate perception of her work. But a recent interview with one of the curators of the show in the New York Times only further emphasizes the idea that Kahlo is a fashion plate whose mythical, beautiful life is worth exploring more than her art. Museums simply cannot stage an exhibition of a women artist and focus solely on her appearance without feeding into age-old, sexist stereotypes of women artists. Exhibitions of women’s art, a relatively modern concept considering the misogyny that has weighed down women artists for decades, should stick to the work, not the lipstick.